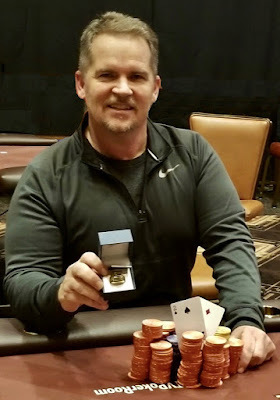 A big field, a long night of play, @BobMatherPoker never loses his own bounty, gathers all the rest and claims the @WSOP Circuit ring for winning #TVWSOPCircuit Event 2 - $365 with $100 Bounties. "It feels great. It is truly off the bucket list to get a ring," Mather told WSOP reporting staff right after his win. "And it is extra special in literally my favorite casino in North America with just the best staff." Mather said he rented a house nearby for the entire Jan. 11-22 timeframe so he could enjoy having the chance to play a full tournament series at TVPokerRoom and play for the opportunity to win a Ring. In just his second tournament of the series, the ring he has, along with $14,335.